How up-to-date is the documentation of your product information? How quickly can you and your development teams access it? Are your products verifiable in terms of requirements? Does your company have a review and assessment process for change requests? Is the product configuration documented on delivery? 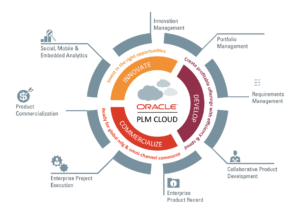 – Ask us about Oracle® PLM. 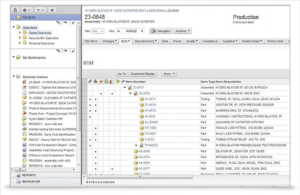 Oracle PLM focuses on the organization and management of product information. Globally distributed development teams work seamlessly with it. The solution is aimed in particular at companies with complex development processes in the automotive, aerospace and defense technology as well as mechanical and plant engineering sectors. Companies on a growth course need a reliable platform that is easy to use and on which brilliant ideas can be brought to market quickly and with high quality. The goal is to ensure compliance. Oracle/Agile Engineering Collaboration (e6) provides unparalleled early-stage functionality to help companies achieve higher success rates when launching new products. In addition, the software simplifies the management of complex products over the entire product life cycle and the entire value chain. The Enterprise Product Record is the complete, up-to-date definition of a company’s products. It includes specifications and design data – from mechanical design to electrical/electronic development to software engineering – as well as articles and bill of material. Integration of all process participants in the entire product lifecycle: from requirements and initial conception, through development and configuration, to maintenance, repair and overhaul measures. Connectivity with CAD integration with various authoring systems, including Microsoft® Office and ECAD/EDA systems, as well as with popular CAD systems such as Pro/ENGINEER®, Unigraphics®, CATIA® V4 and V5 in parallel. In combination with decentralized file management for globally distributed organizations, this provides optimal support for engineering collaboration. Connectivity to ERP systems and legacy applications: Agile Enterprise Integration Platform enables integration of Oracle/Agile Engineering Collaboration (e6) with ERP systems such as SAP. The Enterprise Integration Platform is a powerful middleware solution with an integrated Business Process Management Engine for mapping complex transfer scenarios. For more information on ORACLE PLM please contact us: sales@usb-muc.de. Oracle PLM is a very popular PLM solution worldwide. It is based on the owner PLM system, also known as "CADIM" or "axalant". ORACLE has consistently developed these systems further and distributed them under the name "Agile e6". The latest developments run under the name "Oracle PLM" and are specially developed for use in the cloud, but can also be operated "on premise".